The Imagine All-in-One Cloth Diaper is lined with a super soft fleece inner, keeping baby dry, complimented with a waterproof PUL outer, keeping leaks in. The included fleece-lined, 4-layer microfiber soaker pad snaps into the front of the diaper for added absorbency, but is removable for a quicker dry time after wash. 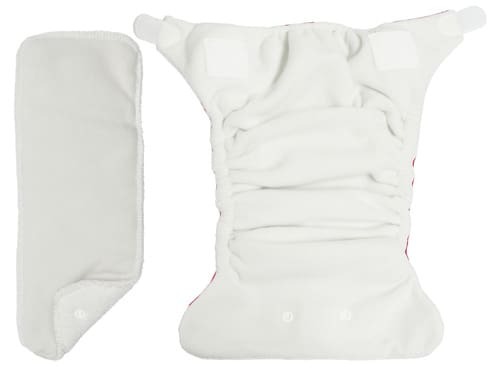 The gentle leg casings prevent leaks while keeping your baby comfortable. Simply put the diaper on your baby and change the entire diaper when it's wet or soiled. There are no pockets to stuff and no folding or pinning! This diaper is adjustable to fit most babies approximately 8-35 pounds.